Euro gold fell to about €1263, platinum gained $13.50 to $1410, and copper fell slightly to about $3.36. Gold and silver equities traded mostly lower and ended with about 1% losses. Tomorrow at 8:30AM EST brings Core PCE Prices and Personal Income and Spending for April all expected at 0.3%. It also brings May’s jobs data. Nonfarm Payrolls are expected at 150,000, the Unemployment Rate is expected 8.1%, Hourly Earnings are expected at 0.2%, and the Average Workweek is expected at 34.5. At 10AM is the ISM Index for May expected at 54.0 and Construction Spending for April expected at 0.5%. Oil fell on “lingering worries about global demand against a backdrop of European debt troubles and mostly disappointing economic data” that sent treasuries higher again. The Dow, Nasdaq, and S&P closed slightly lower ahead of tomorrow’s jobs data. Among the big names making news in the market today were Costco, Ford, JPMorgan, and United. 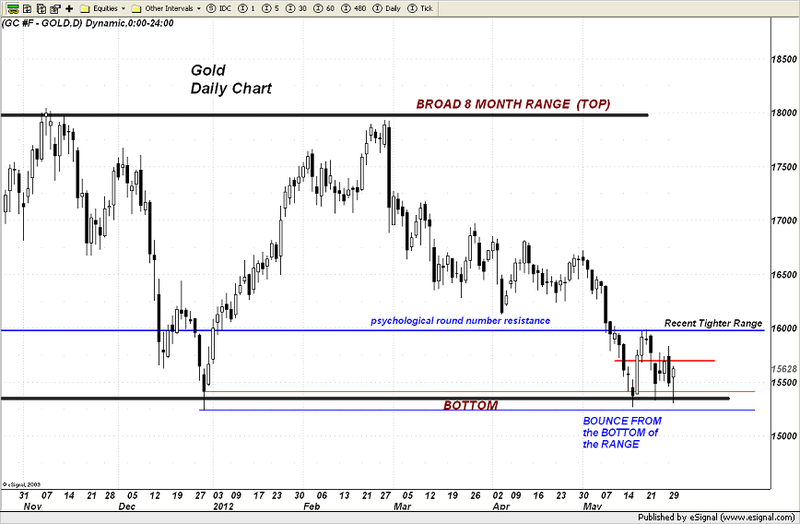 “Gold has once again attracted strong buying down near the bottom of its broad 8 month trading range and has now bounced higher for the day. Strength in the yellow metal has pulled silver up a tad which was sinking under the weight of a collapsing copper market. While some are ready to pronounce gold DEAD as a safe haven asset, the chart picture denotes otherwise, especially given the broad weakness in the commodity sector as a whole and the rallying Dollar, which continues its technical march towards the 84 level on the USDX. Whenever I see gold moving higher alongside Treasuries and the Dollar, it tells me that all such talk about gold being useless as a store of wealth, is simply false. 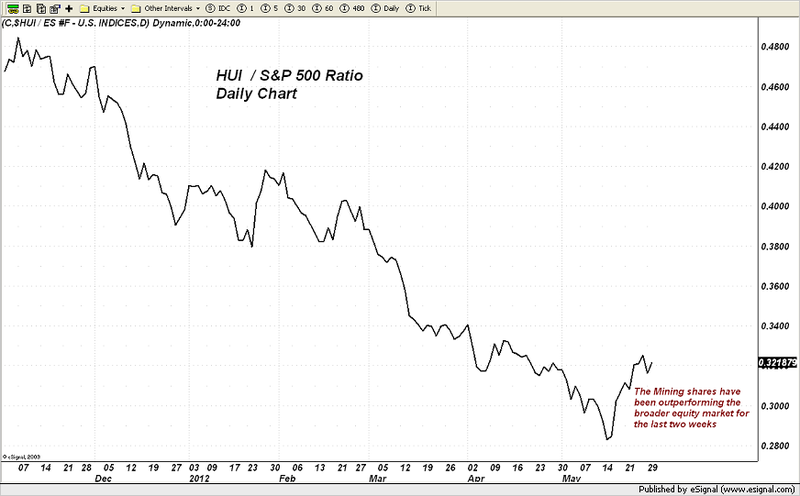 The chart will tell you more than all the pontifications of the short-sighted analysts and pundits. To get any sort of excitement going beyond the continued value based buying of gold, it will need to push through the $1600 level and not falter. COMEX Gold Trust (IAU) Total Tonnes in Trust: 176.19: -0.61 change from yesterday’s data. Silver Trust (SLV) Total Tonnes in Trust: 9,643.17: +24.14 change from yesterday’s data. Tanzanian Royalty’s (TRX) permit, Revett’s (RVM) AGM results, and Golden Minerals’ (AUMN) royalty sale to Excellon (EXN.TO) were among the big stories in the gold and silver mining industry making headlines today.